Ex-Pat's and Geno's: Sleeper debuts Friday!! Hey Philadelphians! My friend Mark has finally stepped out of the shadows (bwahaha) and is fronting his very own band. 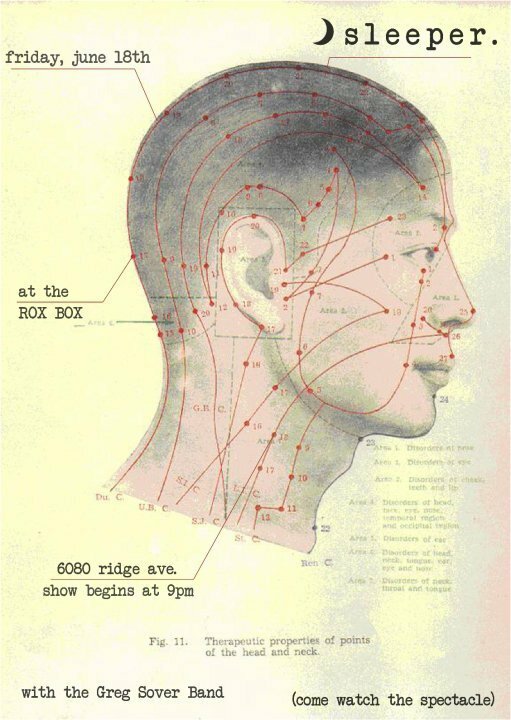 Sleeper will debut at the Rox Box in um... Roxborough... on Friday, June 18. Mark formerly played bass in the band Head, one of my all-time favorite Philly bands. He'll be singing this time around (and judging by the way his sister Lexi railed on vocals in Head, I'm guessing strong pipes run in the family). Filling in on bass in Sleeper is another good pal of mine, Pat Brennan of bands Domi and McRad. He's not only a ridiculously talented musician, but also was a gentleman enough to remain friends with me after I almost vomited all over his self-refurbished custom Saab after one particularly rough Tuesday night at Doc's. You're a good man, Patches. Back to the musical task at hand! Check out Shannon Frost-Greenstein's write up about Sleeper here. If you go on Friday, tell my boys I said hi. Wish I could be there! Thanks for the love, honey! I can't wait to return the favor. I would be honored to have a little blue word in my blog that leads to...YOU! We miss you intensely, and I can't wait for your next trip east.